Zhu Songge says his email box is full of letters, coming in every day from parents nationwide hoping to send their kids to a windowless apartment, which resembles an underground organization: 12 teenage boys from different provinces crammed together, sleeping in the daytime in three bedrooms while working from midnight in the living room where they sit behind 17-inch computer screens and a wall emblazoned with a large graffiti mural. These youths are professional players of the online game League of Legends. 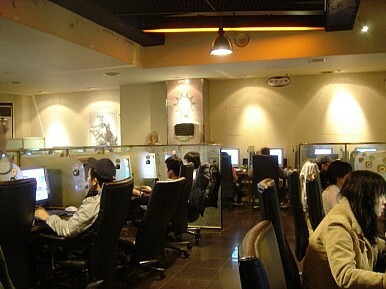 They represent Invictus Gaming Club, based in several rented apartments on different floors of a residential building. Their goal: to win the national cyber gaming championship and secure a place in the World Cyber Games, to be held this year in Kunshan, China. Total cash and prizes at this cyber showdown can amount to millions of dollars. Zhu explains that the number of really talented gamers is much smaller than the number of children who have what it takes to enroll at Tsinghua University or Peking University, China’s top two universities. It would be impossible to imagine all of this just five years ago, when a documentary called Who Took Our Children was popular. The film explores 30 family tragedies that were believed to have been caused by online gaming addiction. One was a 17-year-old boy who poisoned his parents to death when they stopped him from going to an internet cafe, according to the Financial Times. As recently as 2009, many parents still believed the kind of electric-shock therapy invented by a psychiatrist from Shandong province could cure kids’ “electronic heroin addiction,” despite the fact that the Ministry of Health officially banned the practice in July of that year. Despite such horror stories, the status of professional online gamers seems to be improving, especially since China’s General Sports Administration announced in March the formation of a 17-person national team for e-sports to compete in the 4th Asian Indoor and Martial Arts Games. “The players can actually become sports stars and can earn a lot from commercial endorsements,” Zhu explains. Above all, the relatively high salaries and game bonuses are some of the big attractions. Members of Zhu’s club can earn from 4,000 yuan to 8,000 yuan per month and receive additional benefits like free accommodation and transportation allowances. “Many parents are surprised to find that it is actually much better than most white-collar jobs for a fresh college graduate,” Zhu says. Zhu is a law school graduate of Shanghai’s prestigious Fudan University. Two years ago, he quit his civil servant’s job, which is revered as a "golden bowl" by millions of parents and students, to join the club and manage the 12 players. "It is not an easy job since I have to take care of all these immature kids,” he says. ”Sometimes I feel I am a nanny. But it's less complicated than handling relationships with officials in an endless series of banquets."